Spanish, French, Brittish, Dutch, Swedish, Danish and Russian with the years of getting it. 3. North America since 1783 with in years the area´s joined to the states: The 13 old states, 1783 from the English, 1803 bought from France, 1819 bought from spain, 1845 adapted in the Union, Nothe west part adapted in the Union, 1848 from Mexico, 1853 bought from Mexico. 4. South America around 1700 with the Portugese, French, Spanish and Dutch posessions. Looking for an antique map, historical print or plan? Feel welcome and browse our mapsite atlasandmap.com! We have maps, made by Winkler Prins . 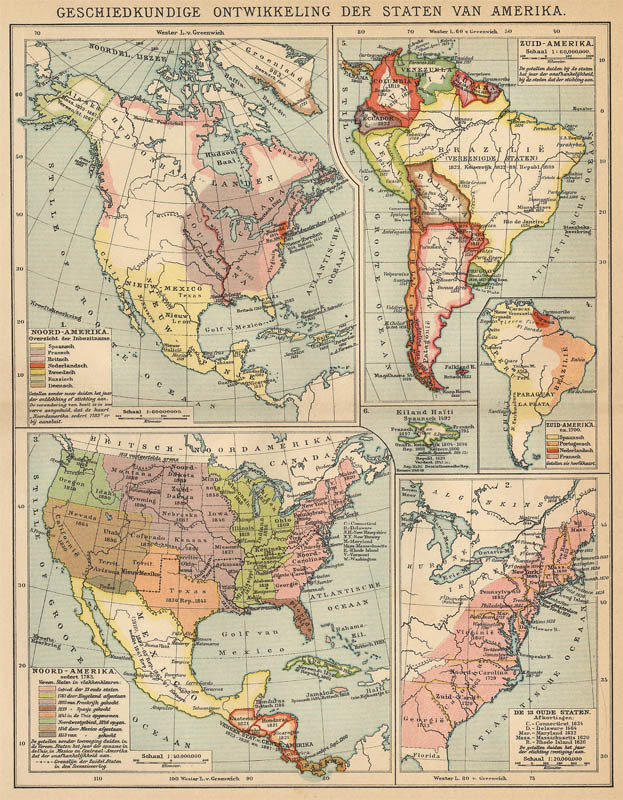 more maps of North America like Geschiedkundige ontwikkeling der Staten van AmerikaPlease contact us if you don't find where you are looking for! We ship worldwide.